So I got to doing a little extra reading about population and spent a little time digging up some exemplars that would help with the design. I found a nice reference which made Caras Celairnen bigger. I did some scaling up of the map and discovered that there was a lot more land than even I though. I looked at a river port on the Severn (Chepstow) to get an idea of scaling and layout. All of which has been changing my thinking on where the town might be situated and how it might be laid out. In Other Minds, Thomas Morwinsky provides some excellent extrapolations of population in Middle Earth. This would revise TA1640 Caras Celairnen to a population of around 4,000, equivalent to a large modern village like modern Overton. The main population sits within an area of 2.5 square kilometres (1.5 square miles). Put in context of the inch to 20miles of the maps produce by ICE for MERP that is a very small area on the map. I scaled up the region and the overlayed a Google map on Overton on to the map. Caras is tiny on the map and that river crossing is huge if it was all scaled. Those roads on the Overton map are two cars wide. By scale the bridge would have been half the width of the city, but its a symbol so we can ignore it. So you can really see that there is plenty of space on the drier portion of the spit to place Caras. My initial plan for the town was far too large. Unless I say the bridge is much further to the mouth of the river.The Uialduin river is half a mile across according to this (give or take). A wooden structure is unlikely to survive without constant modification. However, Swarkstone bridge is 17 arches, made of stone and a mile long (with a causeway). If Dwarves built the town then it is entirely possible that such a bridge would exist. The river Lhun by contrast is nearly two miles wide – similar to the river Severn at the bridges. There was before the bridges a ferry that ran from Aust. A stone jetty providing mooring to cope with the tidal river. Of course no engines, just sail and oars. 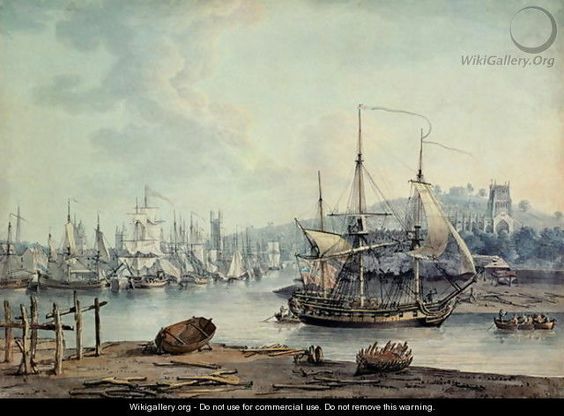 So perhaps more like the image below of the New Passage ferry further down stream in 1727. The medival map of Chepstow could be used as a guide to the sort of layout a town like Caras Celairnen might have. Although Chepstow has no marsh land and the river Wye is only 106 yards across, it was a regular river port with tidal trading links around Europe. The extensive field system provides a realistic idea of how the area around the town is used to support the port population. Short docks and jettys on the inside (slow current bend) provide a good example of the structures that might be in use in Caras. in 1306 Chepstow had 308 Burgages (houses rented from the Lord, hence Burgher). Which looking at the 1686 map leaves me wondering where they all are as there appears to only to be 100-200 houses marked. Either way, with a family size of between 5 and 12 that would put the population between 2000 and 3000 strong. Furthermore, I am sure the map makers didn’t include the serf hovels outside the walls. First things first, this is a fantasy game I don’t have to follow any of the things I see in real life or stick rigidly to the historical facts. Nor do I need to get bogged down in where the town symbol is on the map, or the size of the river scaled up. I just need to stick to the fact that “situated on a rocky spit of dry land at the otherwise swampy junction”. Rocky spit – means the finger sticking out between the two rivers. We are sticking with my original drawing idea and placing it right on the spit. There needs to be a bridge crossing, but it can go where needed to make anchorage sensible. The swampy area can be much bigger than on the map, but there will be some dykes and reclaimed land near the town that will use the levee bank on the Lhun side as the start point. Perhaps a causeway for the bridge road as well. With this I can happily have anchorage up the Uialduin in that nice slow swampy region to the north, especially if the bridge is high enough for small river barges. Indeed, there is nothing to stop a high span if the ground on the otherside starts high enough. Perhaps the reason the Uialduin is not a delta into the Lhun is because it passes through a canyon formed from two hard rock hills. If Caras Celairnen is to be placed on the map, the purpose of the town need to be very clear. If it is purely a ferry port for goods crossing then it can only sit on the Lhun and would link to the bridge over the Uialduin using some sort of causeway road. However, we have established that there is no marked habitation on the opposite side of the river making a ferry unlikely. Goods are more likely to be shipped up and down river using river barges and shallow draft luggers. This leads us to the conclusion it is definitely a multipurpose port. A hub for goods brought overland and down river and also for those that have come up from the sea (bypassing Mithlond). Given that a variety of craft will be using this port a number of anchorages would be needed. If the Lhun is tidal, then so is part of the Uialduin around the mouth of the river. This means that there needs to be sheltered anchorage for some of the ocean going ships with enough draft that they aren’t beached on every tide. This is likely that it would have to be in the middle of the channel of the Lhun. Barges would then transport cargo to shore.So we need barge docks in easy reach of the middle channel of the Lhun. We would also expect barges to wish to use the slower current of the Uialduin for mooring and perhaps some areas of the swamp as dry dock repairs. We can also say there are probably several ferries operating crossings, but that they are unlikely to be permenant routes. We could divide our triangle between the two rivers into each corner zone. The North East corner is really beyond the bridge and although it is possible it might have a sufficient depth for small ocean going ships the presence of marshes suggests not. In contrast, the North West corner is connected to the North road that follows the Lhun. It fits the bill for ocean ships and if the lower portion of the triangle is also marsh then the flats would provide refuge for the river barges. A causeway road would be needed to take road goods to the bridge across the river Uialduin. The south west corner also offers similar attractions to the North west. With the Uialduin backing up water into a marsh because of the Lhun it would suggest that at the meeting of these two rivers in the lee of this spit anchorage is relatively easily. Barges could stay out of the stronger current when unloading ships (less work) and could still be stored in marsh creeks. The bridge is now the only conudrum. Is it a true bridgehead – no further navigation by keeled vessels, or is the bridge special. The former can go further upstream with again a causeway road to link tot he town. The latter could span the river in high arches as a miracle of Dwarven construction (just because no-one mentioned it doesn’t mean I can’t build it). It is not often I get to ponder on something these days, my time taken up by wondering how to get sprogs intereseted in learning stuff to order, but I was planning on making a map of Caras Celairnen over the summer and got to reading some of the source material from Iron Crown (ICE). The Arnor supplement makes some reference to the town of Caras Celairnen as a river port with some detail on the heritage of the town and rulers. This is all free to view on the Notion Club Wiki, which essentially has culled the information from the books. I spent a little while researching what a river port might look like on a tributary to a major river to get an idea of how that might look. I printed off some grid paper from Incompetech and made a quick sketch of where it would all go. So one day this summer I took my own sprogs (not the 30+ belonging to others) to the pool and let them loose, while I sat with a coffee and drew my first location map for years. I put a fortification on the end of the spit and then filled the town in below with some warehouse and merchant houses. I including some noble houses and space for itinerant river workers and captains. I thought about where some of the lower orders might live. Then I ran out of space on my A4 sheet of paper, so the planned marsh side town outside the walls didn’t happen. Hey can’t get everything right on your first go! It was then I started to ponder. Did I have enough dwellings to support the population of a full town? Well as it turned out I was probably about right without planning (if there are around 10 in every household that is not a major house. I can always add a few more houses at the marsh gate at some point. Then I looked at the map again and wondered: how did that marsh form and why is there a path by the big river (Lhun), and is Uialduin a deep enough channel for cargo ships? This got me to thinking have I drawn this right at all. Is Caras Celairnen a fortified town at all? Knowing what I know about river ports (quay) on the Severn, which when you look at the Lhun you are almost forced to compare the two, is this a viable town? My first port of call (past the basic river geography I did at school), was to think about rivers I know well. Have I ever seen a marsh sitting upstream between them and a tributary? Well not really and certainly not with a path on a levee/dyke, because a river prone to big snow melts would scour across that low plain and into that lovely low plain to the south. So search the internet what rivers might have a marsh like this? Well the Amazon river, but that is one big marsh and tropical and kind of unique. The Tigris and Euphrates but that actually is just one very big river delta down to the seas. As is the Ganges, Missippi and pretty much every river you look at. But at least the Tigris and Euphrates did provide an example of a bigger river backing up flow from the smaller river. So perhaps with the winter rain melts off the highlands and Uialduin meandering more the marsh is more viable. If we assume that the path we see is alongside a levee caused by the Lhun flooding over the years. So we have a Riverine type marsh that is navigable as far as the bridge. Bridge?! Hang on that bridge is nominally 5 miles up from the confluence, and bridges in general were only built when it was too shallow for masted ships to navigate up river. That is to say the sailing cargo vessels. Also those marshy inlets that remind me of Romney marsh, and some spots on the Severn, which are useful for anchoring luggers and the like are all cut off by the bridge! I know these maps are not geographically accurate but that really does put pay to the idea that anchorage should be on the Uialduin. Alright so all the anchorage is going to have to be in the bigger river. At least that takes care of the draft problem. Now all the ships have to worry about is the rate of flow and the probable tidal bore that will some up the river every high tide. I know that on the Severn the ships would moor to a quay that ran along the bank and that there was quite a bit of slack needed on the ropes to account for the tidal reach. So let’s assume that similar moorings are going to be needed for this port. OK back up a bit. What does the source material say that might help with the design? Well the Dwarven trading post was built on the hill (conjures up thoughts of hidden passages below) on a shelf of land (non-porus rock or there would be no swamp) that has dropped. No clue as to the shape of the hill. It could be a rounded and weathered mount or it could be an escarpment and still fit the description of a rocky spit. The whole shelf has dropped 1000ft so it would be reasonable to assume that it is more likely to be a rocky escarpment with the vertical side facing the rivers. The sloping side would now drop to the marsh land with its inlets and spaces for flat bottomed barges which can ply trade further up river. We know that Gondor builds an outpost here. They used smaller vessels than the great Gondorian warships used to sail round the coast to transport troops. However, the army encamped on the south side of the Uialduin, suggesting that space is limited on the mount and that possibly the troop docks were temporary structures. Also the draft is not deep enough for large ocean-going ships but river luggers and the like would be fine. So what have I learnt in the process, well always look at your map carefully. If you are designing landscape from scratch it really helps if you think about the conditions that cause your features. Classically that marsh should be down stream, although the town would still be on a hill above it. Also if you look at river ports there is always mooring in the smaller tributary allowing ships to shelter in a weaker current. Next think about your reasons for placing habitation where it is. Although this is a trade route to the capital of Arthedain and can transport goods from Mithlond, it is actually a terrible spot for Dwarven goods. The Arnor gazetteer already has a ferry point much further North which would allow goods to pass across land without the need to go down river. Also there is no transit point across the river on the West bank linked with the Southern route (well there is now with my unmapped town Elvenbyen), so where do all these ferries load and unload goods for the Dwarves? As a landscape designer then we need to keep the geography and the purpose of habitations real. First I must say I owe a debt of gratitude to Tommi Salama’s “Coldwater” map as the starter and providing various features that were adapted to create the final map. Also a note of thanks to Dyson for the cave map that became the smuggler’s caves. It is a real time saver to have people who are happy to draw maps. Fine pencil/pen work is not my strong point. As such I am in the process of buying up maps as a support to these map resources and I encourage you to do this as well. The featured image from Wallpaperup was the final part of the image puzzle. The River Town was always going to be dominated by Rivermen (Northman lineage stock), who would need linguistically to be similar Old English/Saxon style of the Rohirrim. I decided to adopt Norwegian to avoid the names sounding over familar, but still make the setting sound authentic. On the great river Lhun, in a small valley carved by the passage of the Laughing brook, is the small town of Elvenbyen (Westron Riverton). The sole purpose of the small town is as a transit point for goods of Numeriador across or down the river Lhun to Caras Celairnen. A man-made harbour shelters warehouses and pontoons from which Guild approved riverboats load and unload. Guild politics are important in Elvenbyen with various Riverman families controlling the passage of goods and people up and down the Lhun. The the Laug av Vannmennen (Watermen’s Guild) has negotiated paying a guild levied tax to Arthedain and this appears to have allowed the small town to operate outside of any other claim. The flow of goods through the port is heavily from the Numeriador. Raw materials sent to Arthedain via the marsh port of Caras Celairnen such as coal, wood, hides, and ores, but also occasional items crafted in the Dwarven cities of the Blue Mountains. Returning goods are mostly what is required to support the survival of Rivermen and the Dwarves. These include wheat and grain and goods manufactured to a high standard (+5). In addition, there are the occasional luxury goods supplied from the Caras Celairnen through its trade links with Gondor and Harad. As with every frontier town, life can be a little rough round the edges. There are plenty of taverns and inns to supply the needs of trappers and traders who overwinter in the town. Black markets attempt to avoid the enforcing eye of the Guilds and smugglers attempt to avoid paying too much tax. Beware the adventurers who make themselves look too much like an easy mark! The population of Elvenbyen are Riverman through and through, although a few adventuresome folk of other races are to be found. The main focus of the small town is the transportation of goods either across the river to the Marsh road or down river to Caras Celairnen. Control of the town is strictly through the Laug av Vannmennen (Watermen’s Guild) with some influence from the Laug av Handelsmenn (Trader’s Guild). Asbjørn Persson (Loc 16/1 Northman lvl 8). The head of the Persson traders and current Klanenherre (Guildmaster) of the Vannmennen. The Persson family are the richest of the Riverman families and historically occupy the post of Klanenherre. Asbjørn cuts an imposing figure at 6’2” in tooled leather Riverman dress. He rarely, travels the river now, leaving that to his three sons. He is a shrewd merchant, and the current tariffs are set at a point where he feels the market will bear the cost. Of course he knows about the smugglers and tolerates them on a small scale but if they overstep the mark the guild levy will be sent in. The Klanenherre believes in swift and harsh justice. Håvard Ivarsen (Loc 16/3 Northman lvl 6) head of the Ivarsen river family. Second richest family after the disaster that befell the Rolfsons. Håvard is a broad-faced with a tendency to run to fat. His cold blue eyes bely the openness of his features. He has the closest connections with the traders Guild, and uses this influence to channel as much trade towards his boats. Unfortunately, he is not as shrewd as Asbjørn, and despite the fixed rates is less successful in his business dealings. Stein Rolfson (Loc 16/2 Northman lvl 8) head of the Rolfson River clan; a sturdy hardworking Northman with lines of grief around his eyes and sorrow in his heart. Two of his sons took a risky run early this season down the river. The river flow was strong, but both were skilful enough to navigate its currents. However, disaster befell them and both boats were lost. Kåre Arnesen (Loc 5 Nothman lvl 5) is a big hearted individual with a ready laugh and an open hand. Round the taverns and inns he is well known. A successful chandler he supplies many of the boats and has good contacts with both the Vannmennen and the traders. This open friendliness is all a front as he is also the head of the smugglers who operate out of the area. He is able to launder the profits through his chandlery. Any attempt to expose his operations or to muscle in on them will be met with extreme force. Of course Kåre will be nowhere near any of the unpleasantness unless a very strong message needs to be sent. Oddvar Toreson (Loc 6/17 Northman lvl 7) Dressed in fine furs and with weasel features you would not expect Oddvar to be the first choice of Klanenherre for the Laug av Handelsmenn (Guild of Traders). He is however, a very shrewd negotiator and has a reputation of driving a hard bargain. For this reason Rivermen use him to regularly negotiate contracts with Dundadan of Caras Celairnen. Pål Roarsen (Loc 7 Northman lvl 5) A large bull of a man and landlord of the Røyskatt (Stoat). He takes care of his ales and rooms and is careful with his clientele. Beware trouble makers. Kristian Larsson (Loc 8 Northman lvl 5) Honest of face and of a burly build. Kristian runs the ørret (Trout) a haunt frequented by many of the local Rivermen, particularly those who run cargoes from the north and know the backwaters well. It is a rough place with cheap communal board for those who wish to stay. Fights are frequent, but Kristian and his bar staff soon clear the trouble makers into the street. For the right price he can put you in contact with specialist navigators. Trond Bjarnesen (Loc 9 Northman lvl 3) A thin weasly man with greasy hair held up in a top knot. His wiry frame is covered in tattoos. He is the landlord of the Yppig blondine (Buxom blonde) probably the most dangerous inn of Elvenbyen. Although the dregs of the town and the surrounding countryside frequent the inn Trond is not wise enough, not has enough leverage to put the resources to good use. Sindre Steinsson (Loc 10 Northman lvl 4) A handsome young man who looks every inch a warrior and is indeed the model for the painting that hangs above the entrance to the Kriger (Warrior). He is a fraud and a cheat in every sense of the word. Leif Eriksson(Loc 11 Northman lvl 8) The landlord of the Blåfjell (Blue Mountain) is a non-descript Riverman who many immediately forget. He doesn’t stand out in a crowd, he is polite enough, generous enough, but not particularly memorable. This is just the way he likes it. Leif runs a black market operation from his cellar dealing in herbs and potions not readily available on the open market. He pays a cut to Kåre to avoid any trouble. Håvard Håvardsen (Loc 12 Northman lvl 5) A careworn face wrapped in a hooded cloak of green. The injured and sick are brought to him for healing and he never turns one away. Although he has no magic he has a wide ranging knowledge of herbs and often forages for them in the surrounding countryside. Ingborg Jørnsen (Loc 13 Northwoman lvl 4) A plump bustling riverwoman who runs one of the outfitters in Elvenbyen. She is always cheery and appears to have many nieces who help with the repair of garments. Morten Viggosson (Loc 14 Dunadan lvl 6) Despite his claim to be a Northman, (he was raised in a Riverman family near Culwic), Morten is of Dunadan descent. An orphan he has always felt isolated and this has led to his dark brooding personality. Quite frankly all will recommend him as the best guide in the area to get rid of his sour looks. He is competent but don’t get into trouble as he won’t be able to help. Gunnar Gunnarsen (Loc 14 Northman lvl 4) Scarred and dressed in tattered leathers it is easy to assume that this man is the best frontiersman, fighting wild bears and such. Gunnar has in fact been unfortunate in one too many knife fights in town. He is still a competent guide. Hilde Signesdottir (Loc 14 Northwoman lvl 8) A tall and with a sturdy frame and thick features Hilde would never be considered a beauty for her looks, but more than one man has asked for her hand in marriage. Hilde is immensely practical and a skilled ranger. Amongst those in the know she is the best guide and ranger in town. Einar Håvardsen (Loc 15/16/17 Northman lvl 8)Grim-faced and battled scarred, Einar dresses in chainmail and carries a large battleaxe strapped to his back. At his side are two axes that can be used in hand to hand or thrown. The head of the Laug Milits (Guild Militia) he ensures that good order is kept in town. Persson residence. Sitting high above Elvenbyen sheltered from the prevailing winds and weather this impressive, white-washed two story mansion is protected by a low wall. Inside a drive way allows carriages to turn and a small stable and coach house stand either side of the gate. To the rear a small kitchen garden. Rolfson residence. At the end of a long drive almost the last house before the river stand a long low building that ends in a three story tower that looks out over the river. Eaves and shutters are decorated with wave and river motifs, and the house is in general good order, but windows and doors are shuttered tight. Most of the Ivarsen business is now conducted at a nearby warehouse at the main docks. The private jetty remains unused. Ivarsen Residence. Despite the obvious elegance of the long house and the extensions there is something down at heel about this house. Perhaps it is the paint is not white enough or the shutters appear to be inexpertly painted. Three jetties sit in front of this house the largest serves Persson craft the others were built by Rolfson almost like dogs curling at the master’s feet. Thorsen Residence. A moderately decorated long house with one wing sits almost alone the last house before the difficult, rocky river bank to the north. To be sure the owners of this house are above the standard Rivermen, but the house does not have the finery of the big three house. Arnesen Chandlers. Standing opposite the ørret is a veranda fronted emporium of all things to do with river craft and boats. Above the veranda is a sign proclaim “Arnesen”. Arnesen has no direct family, but does employ male assistants to help with sales and delivering stock. You will find everything from trail rations and rope to tarps and oil. If it is to do with travelling the rivers then you can find it here. Toreson residence. A well-built and finely decorated with painted eaves and a well-tended surrounds. Tonje the wife of Oddvar and his three daughters and infant son live here. Røyskatt (Stoat) On the road into the valley that shelters Elvenbyen is a plain inn with the sign of a stoat hanging above the door. Lean to stables round the back allow for visitors beasts to be sheltered. The main door is painted a dull red. The inn looks quiet and homely. Inside you will find decent beer with plain but nourishing food and a clean bed, all at a reasonable price. Ørret (Trout). Opposite the Chandlers is a large building that would appear to have seen better days. Although on closer inspection an observant PC will notice that the windows and doors are securely fitted and really it is the woodwork that is need of a little paint and protection. The interior matches the shabby exterior, with one large bar/lounge in which Rivermen pilots and navigators congregate between times out on the river. Food is cheap and lodging is communal (-25% ). Beer and drinks are +10% base cost. Yppig blondine (Buxom blonde). A gaudy sign showing a buxom blonde with hair in pig tails leering over the top of an ale jug makes this inn appear very appealing. The whitewashed walls and dark wooden door hint at a fun place to spend an evening. The inn itself is filled with the dregs of Elvenbyen and this should be apparent on entering. Tables and chairs are made of sturdy stuff and the beer is passable. Be careful who you insult and don’t flash the cash. Kriger (Warrior). This fine large inn has many features to recommend it to the more discerning traveller. The main door features a frieze of a great hero conquering a hoard of Orcs or some other foul beast. Inside the main bar area is bedecked with red hanging cloths some of velvet (but only where you would notice). The bed chambers are equally well furnished. As expected the charges are above the average +25%. However, the beer is watered and the wine is cheap. The cheapest cuts of meat are used in the cooking and the beds are not as clean as they should be. Sindre rather overspent on outfitting and now needs to recoup costs. Blåfjell (Blue Mountain) Off the main road, North of the bridge towards the mill, is a plain and ordinary inn. The exterior is clean and well maintained and this appears to be a drinking establishment used by the locals. There is nothing out of the ordinary to the casual observer. However, stake out the inn and you may find a small black market in exotic spices. Hospice. A single L shaped building consists of two small rooms that serve as the study and sleeping quarters for Håvard Håvardsen, kitchen, herb preparation room, and one long ward for long-term patients. Jørnsen Outfitters. Conviently situated opposite Laug av Handelsmenn is a two story building with two main doors and unusually large window spaces. In these windows are various examples of needlework and clothing, examples of which can be seen worn by the wealthier townsfolk. Very pretty women and a few gentlemen will attend to your every desire. Wilderness house. A simple wooden structure sits to oneside of the main road. Several cloaked figures lounge outside if the weather is fair. Some will be mending equipment. A fire is always burning inside the main hall. Around the hall hammocks and bedrolls are spread out beside backpacks and equipment. Anyone seeking a guide will be advised to ask at this house. Laug Milits house. A typical L shaped longhouse sits on the main route down into Elvenbeym. Outside sit two militia men dressed in rigid leather armour with spears propped against the wall and shields hanging from hooks above. Inside is a large communal sleeping room with a fire for cooking (there is always a stewpot on the go). A second pair of rooms that can only be entered through a separate locked external door are reserved for Einar and serve as his office and bedroom. Up to 10 militia men might be resident although a levy can be called in times of trouble.
. Laug av Vannmennen. Upon entering the town down the valley road this building is clearly the most important one in town. It is the largest, and ornately decorated with scenes of river life and tales of Rivermen of legends. Three large buildings appear to have been merged into one great complex, or perhaps the two smaller were later additions. Personal office space for all guildmembers takes one wing and the other is designed for visitors to come and negotiate contracts for cargo to be shipped or passage to be booked. As such the public must enter through the grand main entrance fully 8ft high into the atrium area, where then can glimpse at the great feast hall before being ushered into the public offices. The feast hall is a very grand affair with a high table on a dias and rows of tables with benches and the occasional well carved chair. Candelabras lit with oil lamps hang from the vaulted ceiling, which like the outside of the building is carved with fabulous friezes. Laug av Handelsmenn. The other major building that is immediately noticeable on the way into town is the trader’s guild hall. Sitting like the thinner sister next to its fatter more opulent sibling it is still an impressive building. The main entrance leads onto the public offices where trade deals are done in a series of small booths. A tax is charged for striking a deal here, but payment is assured and to default would have disastrous consequences. Private offices are in a two story tower from which the wily traders can see the arriving caravans and boats. A smaller feast hall lies beyond the public trade hall. It is as fine as that in the Waterman’s hall, but on a smaller scale. Mill. A modest mill sits upstream from the town. Imported grain is ground into bread for the inhabitants of the town. Smugglers cove. Of course it is just called the bay. But look very closely and you might notice something amiss on the rocky shore. A small inlet leading into a cave allows the smugglers craft to unload unseen by the casual observer. There is a 5% chance of catching smugglers on any random day. Secret exit from smugglers cove. A very well hidden exit allows the smugglers to distribute goods around town to various vendors or to traders who are to transport the goods from the town out into the wilderness of Numeriador. Baker. You pass a small house with a brick chimney stack. The rich aroma of fresh bread hangs in the air. Warehouse and boatyards. A mix of boat sheds close to the water and warehouse at the water’s edge and further back. Dark alleys abound and at night the area is devoid of people apart from the odd Laug Millits patrol. Winter Camp ground Depending on the time of season this is either a quiet empty field used for common grazing or a loud an raucous encampment. It is why the Laug Milits barrack are on this level and not in town. The falls A small series of cascades drop the Laughing Brook into the town. In winter this can often freeze and is used in ice climbing challenges by bored Rivermen. Storeroom (locked -10, trapped -10 [per -10]) The room contains and oversized sack containing one bolt of blue silk and one bolt of red silk. Each bolt contains enough material for five cloaks and is worth 5 gp weighs 25lb. To the right is a steel door. Storeroom (locked -30 trapped -20 [per -30]) Behind the door are two coffers. The small dark wood coffer contains 12 small packets of exotic incense. The coffer is worth 2 gp and each packet is worth 1 gp. The lid of the other small coffer is sealed with white wax. The coffer feels light if picked up as if it were empty. In reality, it contains ten sealed packets of exotic spices—each sealed with wax and stamped with a seal depicting a stylised sailboat. The whole is worth 15 gp. Main storage and transit area. You step into a large cavern that goes round itself. Several passages lead off either up or down. It contains 20 large casks of cracked salt worth 1 gp each. A large cage contains a beaten and starved baby Great Eagle destined to be the plaything of a noble obsessed with owning the most exotic mounts. Although caged and maltreated the Great Eagle is still a proud, violent predator. Characters getting too close to the cage could be in for a shock. The cage is locked (-10). Anyone with beast languages or animal mastery skills could attempt to talk to the beast and arrange its release. Slope up to hidden exit. The hidden exit is protected by a simple trip wire trap +30 spot +20 disarm. This sends a signal that the tunnel has been discovered to Thorsen and the smugglers. 50 – 120 Elvenbyen is a Guild town with a strict tariff structure enforced by the guild of watermen. The prices are high, but the service is guaranteed. Nominal taxes are paid by the Guild on behalf of members to Arthedain. 120 Passage up and down the river can be arranged discreetly by the right people with no questions asked. Blonde haired and blue eyed, the Northman of Elvenbyen dress in muted tones; favouring leathers that are practical for both the cold and wet weather of Ered Luin. Working gear predominates, but one or two senior figures are marked by finer dress. A warm welcome is extended to all who are prepared to pay for the services they use. Like all ports, there are criminal elements who are less welcoming and visitors should take care when strolling around docks and unlit dark alleys. Elves are viewed with suspicion and they will sign themselves in public against the evil enchantments. Make a diplomacy, investigation type check to discover rumours. Roll 1d10 for each success. Hoegwar campaign links as a transit point. You may wish to use this as a way of providing information of characters. If pursuing key characters then they will have left on a charter down river. Unwanted PCs from Road less travelled could be the cause of disappearances in the nearby woods. Marsh adventure Although the Frog Idol marsh trawl should be left there is still scope for the adventurers being paid for collecting herbs or other items from the marsh. Marsh tower The tower could provide a natural dungeon trawl developed to suit the experience and skills of the party. Forest of fear Who will investigate the mysterious disappearance of travellers in the nearby woods. What is the cause? Are elves bewitching travellers or is something more sinister going on? Guild quest. Bounty hunters wanted. Expedition guards for a trip to Forochel required. Investigations into the smugglers are needed by those unconnected to the town. One of the things that I am enjoying at the moment is rediscovering the joys of populating the environment that my players will be travelling in. I love to be able to create descriptions of places that sound like they are lived in. For reasons why this is a good idea read my thoughts in the Rationale section. If you have read the set-up of this adventure then you will know that we started off using a MERP adventure module. The town of Culwic has a sketch outline and for the adventure provided gives enough NPCs that I can improvise others on the fly. I then started to add to the character of the town with traders and the skill level of the local healer. I did this because I knew before we started out on the next adventure, both players would want to pick up a few items that they realised were missing from their kit. It was still a brief skeleton, but it was enough to make the village believable. No high powered magical items or characters needed, and none appearing thanks to a frantic roll to a request (not that these PCs had that kind of cash). Preparation is a key GM skill. The next adventure set in course some events that will lead the players following a number of trails across the lands. Their failure also means that overhearing the local’s gossip will encourage the players to move on. At this point they are faced with the mountain wilderness or travelling towards Arthedain civilisation to report their findings. They should set out towards Eruimar which again is a location described in the adventure book. However, details here are even less than that for Culwic. As I am intending on setting another step in a series of periodic linked adventures here the players are likely to return for rest and recuperation. In addition, their are some investigative elements to the adventure and it will be helpful to know who knows what and where to find them. I’m not flush with time, but I can give myself a fighting chance of improvising in a game if I have put together a framework of a village. Why is the village there? What is it’s main business? What sort of people live there? What sort of items can you buy? Who is in charge? All quite simple to do and if you are really short of time and want to have something you can throw out at random you can find pre-prepared option from various sources such as Raging Swan’s Village Backdrops (not so easy to use in MERP, but adaptable). So, happy as a lamb, I have spent several days, in small snatched chunks, creating details of the Eruimar, a village that sits on a trading route to a crossing of the river Lhun. The adventure has several characters who remain in the village and adding in a few more key NPCs to make village life interesting has brought life and a couple of red herrings to the whole adventure. To help with the flow of descriptions that create a sense of place, I also worked on some descriptions of some main dwellings and generic ones. It is about this point that I wish I wasn’t so ham fisted at drawing so I could show a sketch of them, but somehow this seems like cheating, and I’m not sure as a player I would want to know all the detail that way. With the adventure planned and a village backdrop planned I went into complete gazetteer mode. I realised that on the official MERP maps there are no marked crossing points or Ferry points to Caras Celairnen (the first official Arthedain town ). It leaves a road that travels along the Rammas (a spur of the Blue Mountains) to the river Lhun with no town or village that has built around a crossing point. Given the width of the river at this point it is really unlikely that traders and travellers are fording, although a nearby marsh could make it possible that there are shallows that could be forded with sufficient local knowledge. However, the local guides would need to live somewhere and with heavy snow melts raising river levels and changing routes it would seem weird that there is no village or town here. Suddenly, I needed to create this town! I had no adventure planned here, but as I began to think about what sort of place this would be, I began to drop in rumours of adventures that will allow me to challenge the players as they pass through. Quickly, the quick sketch has a lot more detail inside my head even though on the page my new town gazetteer only has the same level of detail as that of Eruimar. So I present to you the small town of Elvenbeyn (River town, I’ll blog the details later). A Riverman (Northman) settlement that acts as a major focal point for ferrying goods to Caras Celairnen and other points further up and downstream. I based names on Norwegian, as this fits well with the ideas from Tolkien for this race of man, and gives a character to the town. Obviously, as a trade town of people who are fiercely independent the influence of Arthedain is limited. There are only two things that matter in this town, goods and transportation. Of these transportation is probably the most important. Consequently, a guild of Rivermen who ply their trade on the water seemed like the most likely organising force for social structure. Then there are always goods that need transportation without questions asked so some sort of smuggling operation must exist. As a permanent settlement it will obviously attract it’s fair share of itinerants, but as the population is composed of superstitious, rebellious Rivermen, the elves and Dunedain will be less welcome if tolerated at all. Instead, the hunters, trappers and river runners from the North will flood in for the winter and disperse over the summer. In winter then the town will be a bustling place with casual danger and petty crime, but as the winter snows melt and passage becomes easier the town will be quieter, although not always less dangerous. All in all I feel like I have a location that is ripe for kicking off lots of adventures and now I can’t wait until the players get here.Of course they may never get here and choose to be elsewhere, but that doesn’t detract from the sense of satisfaction from the process of creation.